A little over a year ago, Iwata released a nice cleaning kit which brought some useful tools to the bench to keep your airbrush running smoothly. I was so happy with that set that after trying this set out on my airbrushes, I shot a YouTube video demonstrating the merits of that set. One of the missing elements in this set was a tool to remove the air valve from the airbrush (I improvised with some pointed needle-nosed pliers). I dismantled the HP-CS by hand as far as I could, the soft jaw pliers make removal of the nozzle easy and without harming the chromed surface of the airbrush. The nozzle wrench (red tool) in this kit is sized for some of the other airbrushes in the Iwata line but my cleaning kit provided the correct wrench for the HP-CS. 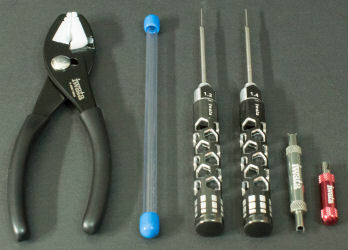 The air valve guide wrench (greenish-silver tool) is perfect for removing and re-installing the air valve guide. The two screwdrivers with the hexagon-patterened handles have non-pointed needles of the same diameter as your airbrush needle portruding out of the screwdriver tips. Simply insert this into the rear of your airbrush and the needle tip aligns the screwdriver head to the needle-packing screw inside. You can loosen or tighten the packing screw to optimize your airbrush, or remove and replace them if needed. I completely dismantled my HP-CS, inspected the air and paint flow channels, and reassembled the airbrush in just a few minutes. As with any such endeavour, the first try at dismantling/cleaning/reassembling your airbrush might take a little longer, but with practice and the right tools, it becomes quick and easy. I recently had need of such a set of tools as I was using my HP-CS to apply Vallejo primer and ran into the dreaded tip-drying phenomenon, even after using thinner with retarder. In the process of trying to clear the blockage without emptying my paint cup, the thinned primer back-flowed into the air valve. I learned some new aspects of the HP-CS which I will share in an updated cleaning video soon. This tool set would have made that cleaning job faster and easier. 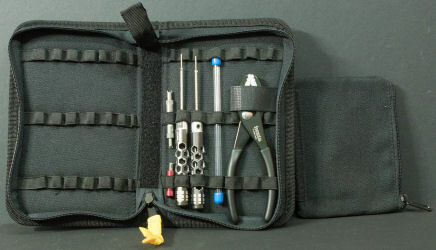 Combining this set with the fine brushes and nozzle wrench from my cleaning kit, I have virtually all of the tools I need to fine tune, clean, and maintain my airbrushes. While this set may be more than the average modeler might need using a single airbrush, this set (along with the cleaning kit) would be ideal for an IPMS chapter to invest in so that a designated airbrush 'guru' can help club members keep their Iwatas up and running. 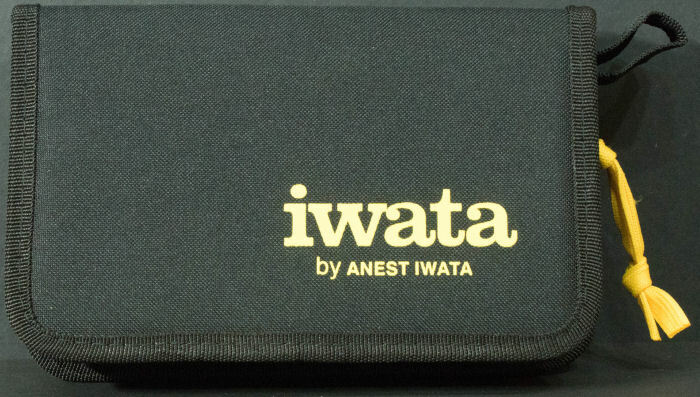 My sincere thanks to Iwata Media for this review sample!